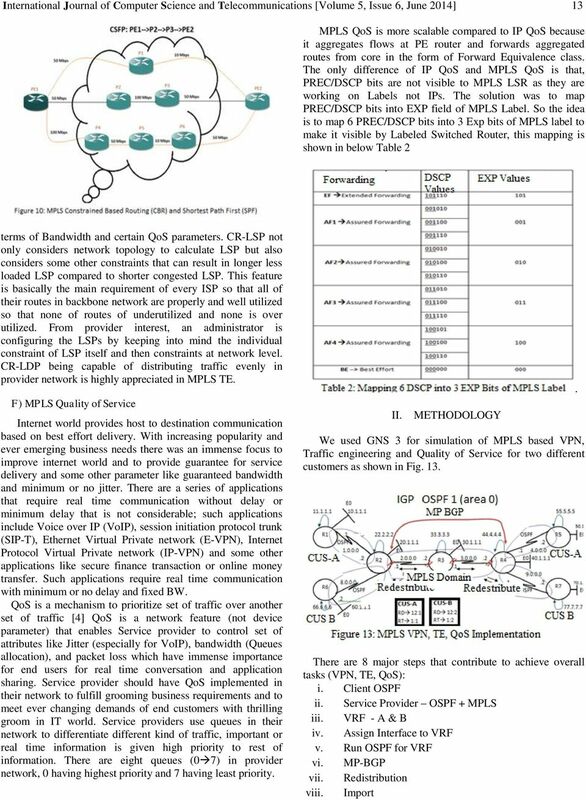 Download "Implementation of Traffic Engineering and Addressing QoS in MPLS VPN Based IP Backbone"
5 International Journal of Computer Science and Telecommunications [Volume 5, Issue 6, June 2014] 13 MPLS QoS is more scalable compared to IP QoS because it aggregates flows at PE router and forwards aggregated routes from core in the form of Forward Equivalence class. The only difference of IP QoS and MPLS QoS is that, PREC/DSCP bits are not visible to MPLS LSR as they are working on Labels not IPs. 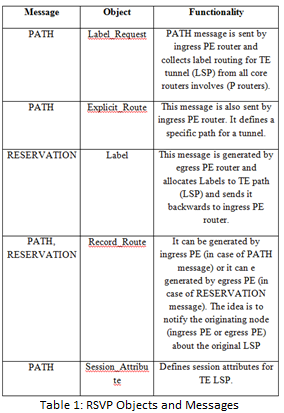 The solution was to map PREC/DSCP bits into EXP field of MPLS Label. So the idea is to map 6 PREC/DSCP bits into 3 Exp bits of MPLS label to make it visible by Labeled Switched Router, this mapping is shown in below Table 2 terms of Bandwidth and certain QoS parameters. 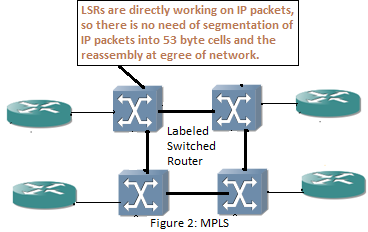 CR-LSP not only considers network topology to calculate LSP but also considers some other constraints that can result in longer less loaded LSP compared to shorter congested LSP. This feature is basically the main requirement of every ISP so that all of their routes in backbone network are properly and well utilized so that none of routes of underutilized and none is over utilized. From provider interest, an administrator is configuring the LSPs by keeping into mind the individual constraint of LSP itself and then constraints at network level. CR-LDP being capable of distributing traffic evenly in provider network is highly appreciated in MPLS TE. F) MPLS Quality of Service Internet world provides host to destination communication based on best effort delivery. With increasing popularity and ever emerging business needs there was an immense focus to improve internet world and to provide guarantee for service delivery and some other parameter like guaranteed bandwidth and minimum or no jitter. There are a series of applications that require real time communication without delay or minimum delay that is not considerable; such applications include Voice over IP (VoIP), session initiation protocol trunk (SIP-T), Ethernet Virtual Private network (E-VPN), Internet Protocol Virtual Private network (IP-VPN) and some other applications like secure finance transaction or online money transfer. Such applications require real time communication with minimum or no delay and fixed BW. QoS is a mechanism to prioritize set of traffic over another set of traffic  QoS is a network feature (not device parameter) that enables Service provider to control set of attributes like Jitter (especially for VoIP), bandwidth (Queues allocation), and packet loss which have immense importance for end users for real time conversation and application sharing. Service provider should have QoS implemented in their network to fulfill grooming business requirements and to meet ever changing demands of end customers with thrilling groom in IT world. Service providers use queues in their network to differentiate different kind of traffic, important or real time information is given high priority to rest of information. There are eight queues (0 7) in provider network, 0 having highest priority and 7 having least priority. II. 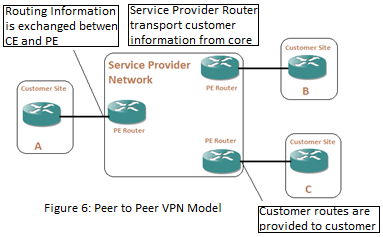 METHODOLOGY We used GNS 3 for simulation of MPLS based VPN, Traffic engineering and Quality of Service for two different customers as shown in Fig. 13. There are 8 major steps that contribute to achieve overall tasks (VPN, TE, QoS): i. Client OSPF ii. 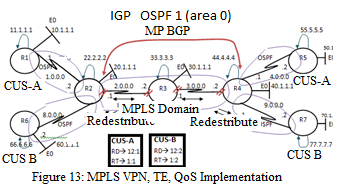 Service Provider OSPF + MPLS iii. VRF - A & B iv. Assign Interface to VRF v. Run OSPF for VRF vi. MP-BGP vii. Redistribution viii. Import. 6 III. 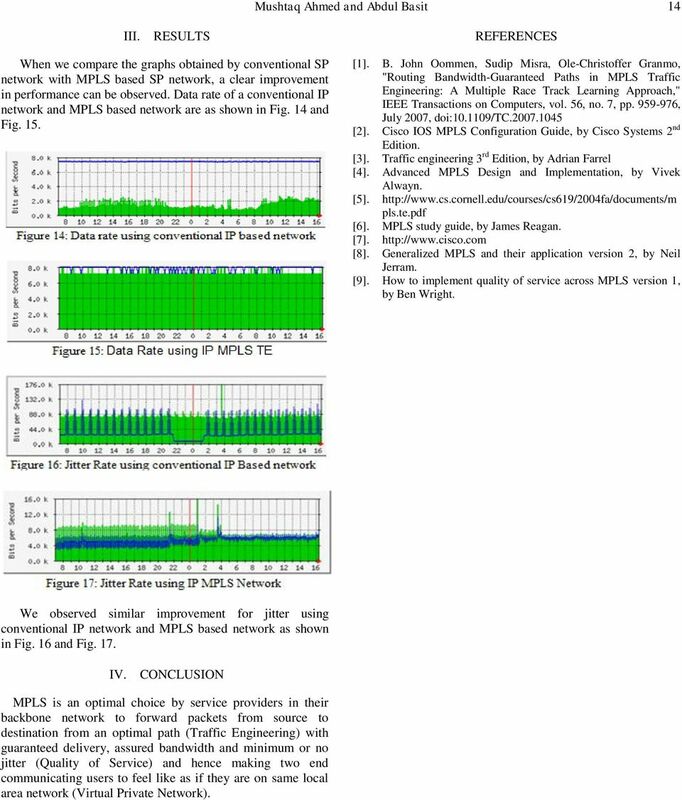 RESULTS Mushtaq Ahmed and Abdul Basit 14 REFERENCES When we compare the graphs obtained by conventional SP network with MPLS based SP network, a clear improvement in performance can be observed. Data rate of a conventional IP network and MPLS based network are as shown in Fig. 14 and Fig. 15. . B. John Oommen, Sudip Misra, Ole-Christoffer Granmo, "Routing Bandwidth-Guaranteed Paths in MPLS Traffic Engineering: A Multiple Race Track Learning Approach," IEEE Transactions on Computers, vol. 56, no. 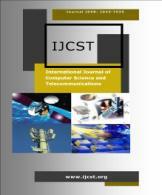 7, pp , July 2007, doi: /tc . Cisco IOS MPLS Configuration Guide, by Cisco Systems 2 nd Edition. . Traffic engineering 3 rd Edition, by Adrian Farrel . 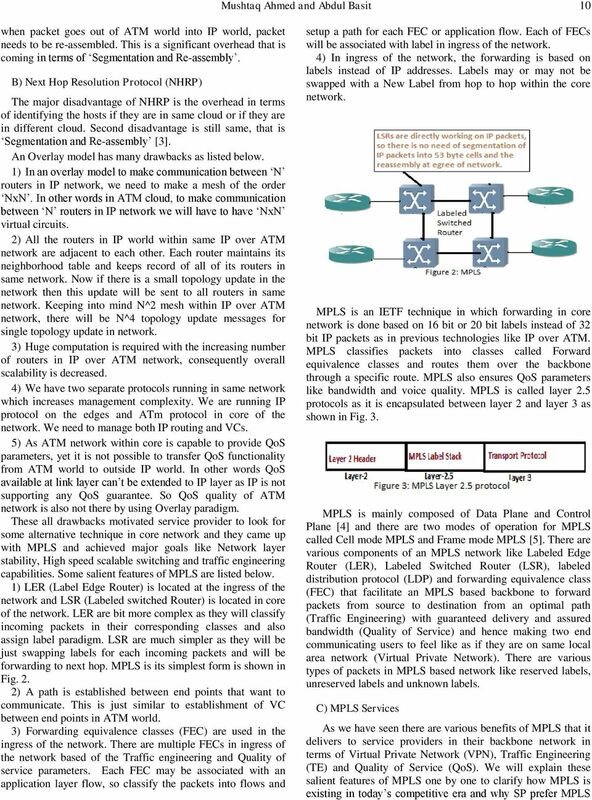 Advanced MPLS Design and Implementation, by Vivek Alwayn. . pls.te.pdf . MPLS study guide, by James Reagan. . . Generalized MPLS and their application version 2, by Neil Jerram. . How to implement quality of service across MPLS version 1, by Ben Wright. 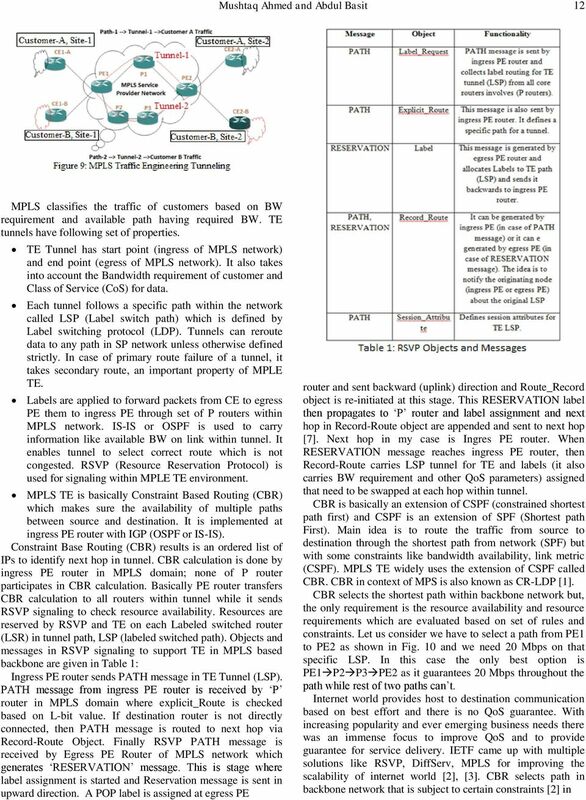 We observed similar improvement for jitter using conventional IP network and MPLS based network as shown in Fig. 16 and Fig. 17. IV. 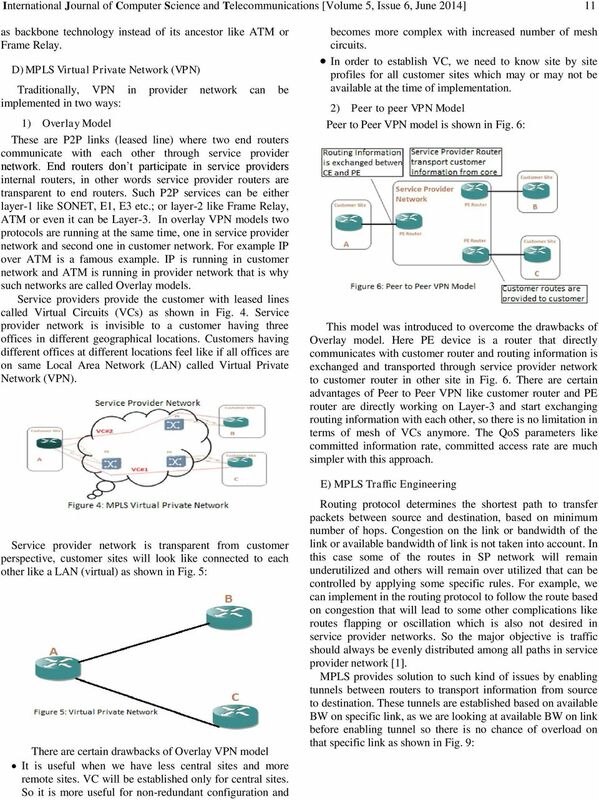 CONCLUSION MPLS is an optimal choice by service providers in their backbone network to forward packets from source to destination from an optimal path (Traffic Engineering) with guaranteed delivery, assured bandwidth and minimum or no jitter (Quality of Service) and hence making two end communicating users to feel like as if they are on same local area network (Virtual Private Network).